For most of us, a house just isn’t a home without a pet. Millions of families value their pets as furry family members. A child’s experience of growing up with that special pet will stay with him or her through an entire lifetime. Create a special keepsake to celebrate the important role your pet plays in your family with the Pearhead Pawprints Keepsake Frame. This high-quality, heirloom frame holds both a favorite pet photo as well as a custom pawprint impression that’s easy and fun to make right in your own home. Do children benefit from having a pet? Responsibility – As children grow and take on pet care duties like brushing, walking, feeding, and bathing pets they learn about being responsible for another being’s health and happiness. This helps develop empathy and the ability to put someone else’s needs above their own wants. Socializing – Having a pet can often bring even introverted children into social situations that they may otherwise shy away from. When you are out with your pet for a walk or playtime, other children naturally show interest. Likewise, most children are proud to share stories about their pets with new friends, which helps them express themselves with ease. Feeling safe – Pets often make children feel safer and give them someone to confide in when feeling lonely or sad. Dogs and cats always seem to listen without judgment and provide comforting companionship in times of loneliness. Stress reduction – As any pet owner knows, curling up on the sofa and petting your dog and cat helps ease the stress of the day. Pets bring a smile to your face, lower your blood pressure, and reduce anxiety for you both. Enjoyment of exercise – Just like kids, pets love to play! Even when parents get too tired to run or throw the football, pets are always there to chase a favorite toy or go for a run. Playing with a dog or cat is an excellent way to keep a child from spending all of his or her leisure time in front of a computer, cell phone, TV or video game. Respect – Caring for a pet can teach a child respect for nature and the importance of being gentle and considerate. Confidence, self-esteem & maturity – As a child grows and becomes more involved with caring for a pet, so does his or her self-esteem and self-confidence. The ‘I can do it’ feeling of walking a pet for the first time or remembering to fill an empty food dish is very empowering to a growing child. When they understand that their pets depend on them, children are usually proud to rise to the occasion. Generosity – Whether it’s sharing a bit of a peanut butter and jelly sandwich or scooting over to make room on the bed, children learn how good it feels to be generous by sharing with their pets. The truth is, pets can have the same impact on family members of all ages! Having a pet in the home can be beneficial for the entire family to strengthen family bonds and remind us what unconditional love is all about. Of course, parents must teach children how to respect a pet’s boundaries, as well as train pets how to behave with children. Celebrate the special love you have for your pet with the Pearhead Pawprints Keepsake Frame. Available as either a hinged desk frame or a wall frame, these classically styled mahogany wood frames display a favorite pet photo along with a pawprint impression you create right at home. The Pearhead Pawprints Keepsake Hinged Desk Frame measures 11.5″ x 7.5″, while the Pearhead Pawprints Keepsake Wall Frame measures 12″ x 9.5″. Both styles hold a 4″ x 6″ pet photo on one side and a custom-molded pawprint impression on the other side. Each Pearhead Pawprints Keepsake Frame kit contains everything you need to make a family heirloom dedicated to your beloved dog or cat, including the mahogany wood frame, glass, acid-free mat, air-dry impression material, rolling pin, shaping ruler, spacer, double-sided adhesive tape, and instructions. Creating the pawprint is an easy, no-mess project. It’s a safe process that requires no heat or baking. Even children can partake in the fun. Simply roll out the included impression material with the rolling pin, gently press your pet’s paw into the soft clay-like material, shape with the shaping tool and let dry. The good news is, if you’re not happy with the first pawprint results, simply knead the impression material and roll it smooth for another try! When dry, attach the pawprint impression to the backing board included with the frame using the double-sided adhesive tape, insert your favorite photo of your pet and you have a keepsake your family will treasure for years to come. 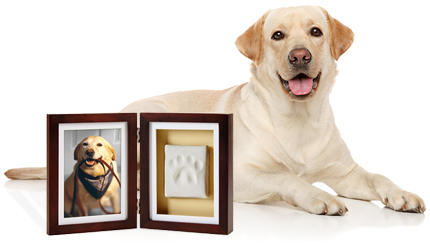 Honor the unconditional love you and your family share with that special pet with the Pearhead Pawprints Keepsake Frame. It also makes a pawsitively purrfect gift for the pet lover in your life! Win a FREE Pearhead Pawprints Keepsake Frame! Would a Pearhead Pawprints Keepsake Frame be the perfect addition to your home? Just leave a comment below and you could win a FREE Pearhead Pawprints Keepsake Frame from 1800PetMeds! Two winners will be chosen at random on Wednesday, October 25, 2017, so everyone who participates has a chance to win! (Limited to residents of the U.S.) Good luck! Congrats to the drawing winners: Patricia B and Barbara A. Look for an email from us to claim your prize! This is the perfect gift for all pet owners! Shelbie my rough collie would look good using this. Hulk, My Chemo rescue German Shepherd has been helping me stay alive for 7 yrs..now with stage 4 metastatic Cancer and his immune disease we help each other Eveyday..I would Love this!! Such a wonderful idea! It looks very attractive & I would love to have this keepsake of my 6 month old rescue puppy “Cory” to display for all my friends and family members. Also, If I were to win this from your website I would be very grateful because I could look back on it years from now to see how much he’s grown. Absolute necessity for any true pet lover. Just moved in to a new house and this would look great on our living room wall. I would love to win this frame I rescued my Bella 8 years ago she is always by my side love her so much! She would look great in this frame! I’ve lost so many of my Furry Babies and kept collars, all vet papers, anything related to them. This is the most wonderful way to have now and forever for Munkin. She just had her right eye tissue taken out and sewn up. They said she was blind in the beginning but I worked and worked with eyes. She now’s one beautiful blue left eye that finally developed and white eye liner on her right eye, since the scar is white. I tell her she’s got her make up and she’ll look up at me and smile. Munkin is Momma’ s BIGGEST WUV! She has so much Wuv to give her Momma, her adopted kitten, Munkins fixed, and Wuv for e everything in the house. She WUV this just as much as I worshipped it. Thank you for the chance to win. THIS would be perfect! This is a very kind of you.. The keepsake idea is memorable and dear.. Thank you! What a wonderful keepsake, but I’d have to get THREE of these! There is no way I could choose just one of my babies! Nice idea!! Hope to win so I can have a keepsake to treasure for years. This is awesome! Would love to have this keepsake for my Buster Lee! It would be something for years to come! This is such a wonderful idea! We have four rescued fur babies right now, all getting up in age. How special it will be to remember them this way some day. I love this keepsake ! I already have the perfect spot to display my “Sunshine”. She is a rescue cat and although her back legs don’t work, she brings light and happiness tp my lifeeveryday ! I plan to get one of these for all my friend’s pets! What a perfect gift for someone who has a furry friend at their home to always remember them by. I need to get a couple for my own keepsake of my best, devoted, friend for life who has left paw prints all over my own heart! Just love that frame, but most of all, I love opening up E-mails from 1800PetMeds and seeing my sweet Ditto’s face pop-up to remind me of how much he loves me. After 13 years with him he will always be a big part of my life. I would love the opportunity to win this frame and paw print maker. It sounds like a nice craft to do with my pets!